To shout or not to shout? That is the question. The answer? It depends. If you’re playing Hamlet onstage, you may need to project your voice to the audience in the back row. But if you’re playing him in a movie, you probably want to dial that dialogue down to a whisper at times, drawing viewers in close to share the Dane’s subterranean struggle. Any experienced actor knows this. And, along similar lines, the chasm between the science of improvisational theater and the art of motion pictures is vast. It’s one thing to take experimental risks in front of a live audience: Your audience is ready for on-the-spot surprises. But in art films, we’re looking for visual poetry and listening for smart writing. It’s hard to capture a sense of transcendence and timelessness in the incidental and immediate. But that’s what filmmaker Josephine Decker is going for in her daring and experimental new film Madeline’s Madeline. She’s not the first to find inspiration for a film within an improv community. 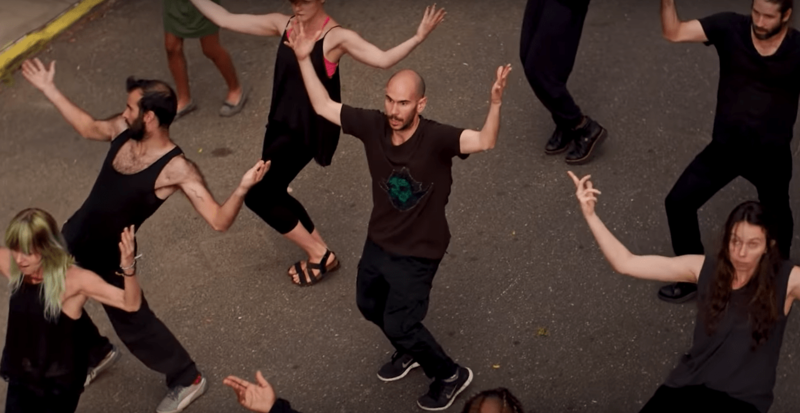 2016’s Don’t Think Twice found an affecting drama behind the scenes of an improv sketch-comedy show. The radiant Helena Howard plays Madeline in one of 2018’s most intriguing performances. But this movie is an altogether different endeavor: It’s hard to tell if this was a scripted story or one that emerged in the telling, moment by moment, because the scenes seem improvised but so does every other aspect of the film: the cinematography, the editing, even the sound design. As a result, we feel like the movie is being born of a fever dream right before our eyes. There is a story told here — one about young Madeline (Helen Howard), an adolescent with an uncanny knack for acting, whose participation in an improvisational acting workshop becomes a sort of therapy. As workshoppers participate in various laboratory exercises, their director — Evangeline (Molly Parker) — seeks inspirational discoveries that she can build upon with the aim to produce a major project. It doesn’t take long for Madeline to emerge as a promising talent, and for her storm of emotional turmoil to become the cyclone that draws them all into her orbit. In some ways, the film becomes a cautionary tale about visionaries who see everything, including the sufferings of others, as “material” — and who forget the importance of telling the truth in love. Madeline is the knot in the rope in a tug of war between two mothers. One wants to save her with a straitjacket of rules and warnings. The other has no boundaries at all; while at first she seems benevolent, eager to embrace all outcasts, her discernment eventually dissolves under the force of a kind of vampiric zeal. Evangeline drills straight down into the oil well of Madeline’s troubles, pumping them up into a geyser of theatrical energy. It gets worse: And before it’s over, Madeline’s high-anxiety, control-freak mother (Miranda July) is drawn into Evangeline’s exploitative, almost predatory sights. Let’s just say that I doubt this movie will make anybody want to sign up for improv class. But buckle up: This is a high-speed journey of hairpin turns, on-the-spot inventions, and a point of view can that can shift from deep within Madeline’s fragile emotions to the whirligig energy of dance-like exercises. Your mileage may vary, and what’s more, you might need to pull the car over for a breather now and then. Early in the film, its relentlessness is exhilarating. I found myself rooting for Decker and her cast, wanting to see how long they could sustain this high-wire juggling act. It’s rare enough to see a film so focused on female characters that passes the Bechdel Test, caught up in questions more interesting than “Who belongs with whom?” It’s also rare enough to see a movie that asks so much openness, agility, and interpretive participation from its audience. As Evangeline, Molly Parker is fantastic and, ultimately, terrifying in this, an artist who prioritizes art as an end in itself. Is she a manifestation of Decker’s fears about who she might, in a worst-case-scenario, become? This question reminds me of how Darren Aronofsky’s film made me wonder how autobiographical his movie mother! might be, with its story of the destruction wrought by an artist with a God complex. Miranda July as Regina, Madeline’s maddening mother. Miranda July is equally and oppositely intense as someone painfully fearful of openness. The film’s primary thread of suspense is strung between Regina’s worries about, well, everything and Madeline’s inclination to impersonate her mother’s anxieties in the lab: We know that things will go badly when Regina encounters a mirroring of her madness in art. And Howard is wild and enchanting as (if you will) Madeline in the Middle. She makes the mercurial young actress’s struggle to find a sense of herself and hold it, without surrendering it to a Svengali, compelling. She’s caught between someone who wants to insulate her and someone who wants to take her apart and use everything that is rightfully hers for some contrary purpose. As the relentlessness of the film’s flamboyance goes on, it releases a sense of frighteningly volcanic potential I remember sensing in certain improv and acting workshops, those that did not care to cultivate a sense of conscience and responsibility alongside a sense of courage. Molly Parker as Evangeline: inspired visionary or dangerous opportunist? I remember seeing young acting students around me urged to “tap into their darknesses” and “open themselves” to any kind of spirit, and I saw some of them deeply wounded by the forces that overcame them. One suffered a kind of seizure mid-improv, and I lost a friend; his precarious capacity to cope with the world was upset by his irresistible attraction to “going there” in extreme immersive theater. I often wonder what happened to him after his breakdown. Sometimes, the energy that has been bound up within us in restrictive households will, when finally given an opening, explode us into an equal and opposite extreme of boundlessness, where we lose the selves that self-control and caution can coax into being. 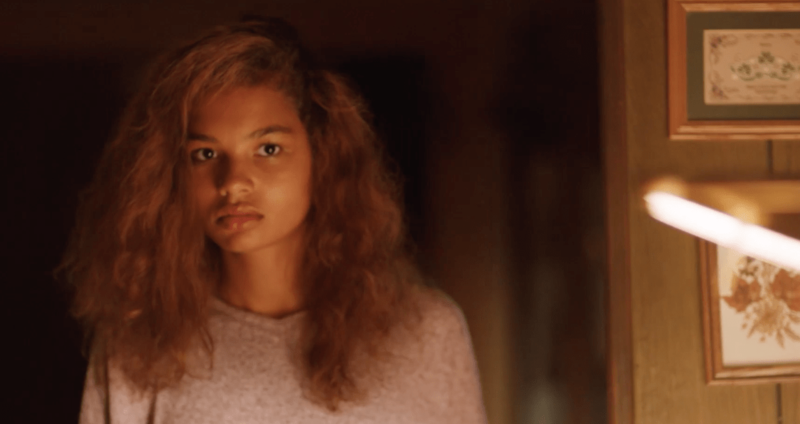 For all of its ambitions and energy, Madeline’s Madeline feels like a film made by Evangeline — one that blasts off in an attempt to escape the gravity of dramatic convention, but that, due to its lack of restraint, cannot hold together. Every time Madeline’s Madeline starts to cast its nets around something beautiful, it has to turn and spin flamboyantly away on some other current of inspiration, accommodating some new rush. Energy overpowers the substance. It breaks apart before it can make a landing. Perhaps its zeal for transcendence is just too much within such a fragile dramatic construction. Film critic David Ehrlich, one of the movie’s most enthusiastic champions, admires how the film’s ambitious structure allows it “to not only question if it’s right to tell someone else’s story, but also to ask if it’s even possible.” And that’s true. But I’m so busy following Decker’s prompts to interpret its heavy symbolism, to follow its shifting modes, to understand its enigmatic characters who are always in motion, that I can’t stick with its storyline. And this meta-script keeps flat-out reminding us that “It’s a metaphor.” Come on: Allow us, please, to suspend our disbelief. 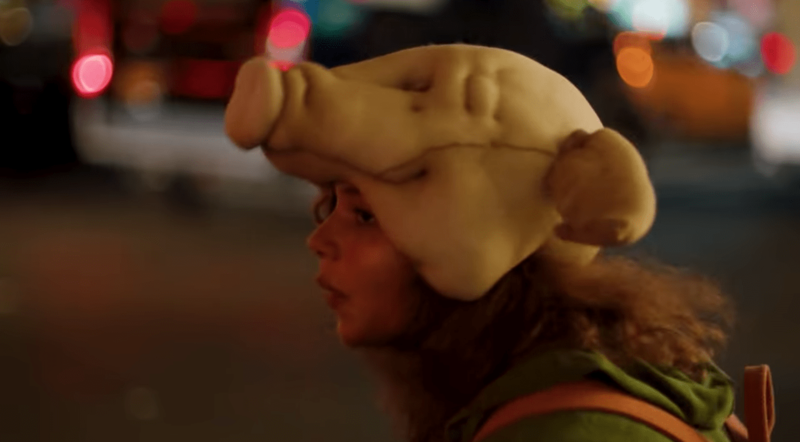 What’s with the pig masks? “It’s a metaphor!” shouts the movie. I was a singer in an improv comedy band for a long time, and I learned to love the rewards and surprises that can happen in a pressure-cooker of experimentation. It’s a practice of discovery. And I love to watch filmmakers try to harness spontaneity to meaningful effect. We’ve seen magic from Terrence Malick’s army of exploratory cinematographers. We’ve visited a map of unforgettable subcultures spun into life by Christopher Guest and his try-anything actors guild. Half of the laughs in Anchorman and other SNL-alumni comedies seem to come from inspired moments of ad-lib banter. But this film reminds me, ultimately, of some of my creative writing students who are so focused on expressing emotional extremes, or trying some wildly experimental concept, that they can’t concentrate on the fundamentals enough to suspend their readers’ disbelief for one simple scene. One of the few quiet, meditative moments in the film — one of many stories teased and tossed aside. By contrast, Aronofsky’s mother! had a similar energy and ambition, but it had a strong line of narrative coherence throughout, and characters who were complex and believable. For all of its conceptual ambitions, it kept me anchored to the sufferings of Jennifer Lawrence’s character through every surrealistic flourish. I believed in her from beginning to end. Madeline’s Madeline is just too eager to chase every big idea; it never quite transcends a sense of brainstorming to become a world I believe in. Perhaps the embrace-everything ethic of “Yes, and…” isn’t the best strategy for a final draft of a work. Nevertheless, I admire this film for its ambitions, and I can’t wait to see what Decker does next.